For that once in a lifetime event, you deserve the sculpture of your dreams! We want to make that happen, be it a classic wedding sculpture design, or something inspired from within. To create that lasting memory .....evoke the passion that brought you together. Let us produce a sculpture for you using pure crystal clear ice sculpted with passion. "Over the years I have been asked to sculpt many pieces for weddings, fairy castle, replica of a stone sculpture, wedding cake, buddha, guitar with a rose frozen inside, chapel window, cypriot bridal carts, rearing horses and even a tiger. These were symbols that had great significance to the couples for whom they were created. To create a sculpture for couples on their wedding day is a great honor. To create something meaningful is very satisfying and pure." Glenn Smith is an artist: who takes pure water and pure power to make pure Ice and pure passion to sculpt it! Wedding Designs can be any size to enhance your reception or highlight your buffet. We have many designs to choose from, they can be purely decorative or fully functional, (e.g. refrigerate your seafood buffet). 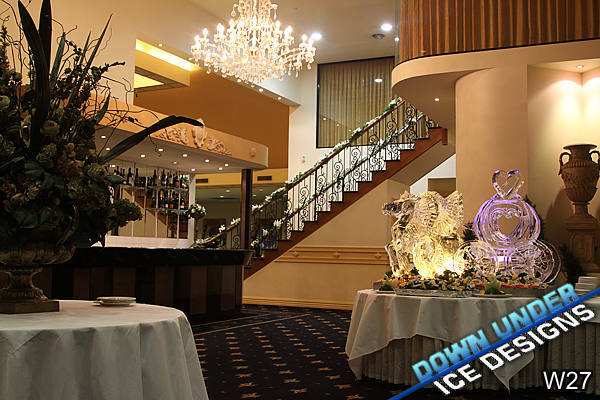 Ice carvings are set up on your display/buffet table, supplied with an ice tray for drainage, and we also supply special lighting. Single block ice carvings stand approximately 1 meter high (plus the height of the display tray) and last approximately 6 to 8 hours.